Chelsea defender Ola Aina made his first appearance for Nigeria in a closed door friendly between two teams formed from the Super Eagles squad at the Hive Stadium in London. Also making an appearance at your in the encounter were Eberchi Eze from Queens Park Rangers, Chuba Akpom, Noah Bazee, Tyronne Ebuehi and Manchester City defender Nathan Oseni. The match was played in place of a botched friendly against Burkina Faso at the same venue after seven Stallions players failed to secure entry visas to fly into the United Kingdom. The game ended 1-1 with Kelechi Iheanacho and Kayode Olanrewaju on target for both sides. Stand-in skipper Ogenyi Onazi led a Team 'A' side comprising of Daniel Akpeyi, Leon Balogun, Ola Aina, William-Troost Ekong, Elderson Echiejile, Wilfred Ndidi, Oghenekaro Etebo, Kelechi Iheanacho, Moses Simon, Alex Iwobi. The Team 'B' side captained by Kenneth Omeruo had Ikechukwu Ezenwa in goal, Tyronne Ebuehi at right-back, Chidozie Awaziem, Juwon Oshaniwa at left-back, Shehu Abudulahi, John Ogu in central midfield, Kayode Olanrewaju, Isaac Success, Ebere Eze. According to Super Eagles media officer of the team, Toyin Ibitoye, the game was a good test for the squad. 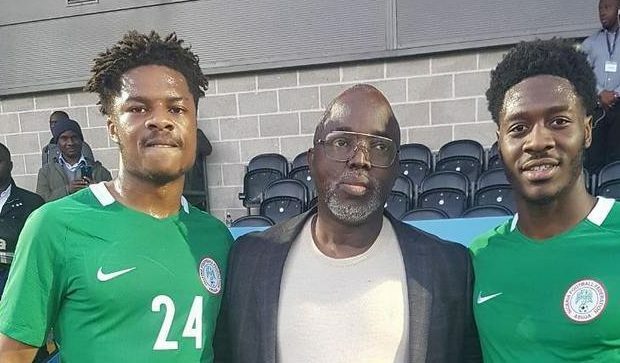 He also told Completesportsnigeria.com from the team's camp in London that the players were excited to represent the country at international level. Ibitoye also added that several foreign-born players of Nigerian descent are eager to play for the Super Eagles. "The mood in camp is awesome and the players coming in for the first time are fully committed to representing Nigeria at the international level so it's a good omen for the team," Ibitoye told newsmen.